At its core, an economy is about providing goods and services for human well-being. But many economists and critics preach that an economy is something far different: a cold and heartless system that operates outside of human control. In this impassioned and perceptive work, Julie A. Nelson asks a compelling question: If our economic world is something that we as humans create, aren’t ethics and human relationships—dimensions of a full and rich life—intrinsically part of the picture? Is it possible to take this thing we call economics and give it a body and a soul? 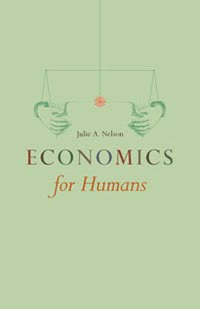 Economics for Humans argues against the well-ingrained notion that economics is immune to moral values and distant from human relationships. Here, Nelson locates the impediment to envisioning a more considerate economic world in an assumption that is shared by both neoliberals and the political left. Despite their seemingly insurmountable differences, Nelson notes that they both make use of the metaphor, first proposed by Adam Smith, that the economy is a machine. This pervasive idea, Nelson argues, has blinded us to the qualities that make us work and care for one another—qualities that also make businesses thrive and markets grow. We can wed our interest in money with our justifiable concerns about ethics and social well-being. And we can do so if we recognize that an economy is not a machine, but a living, beating heart that circulates blood to all parts of the body while also serving as an emblem of compassion and care.